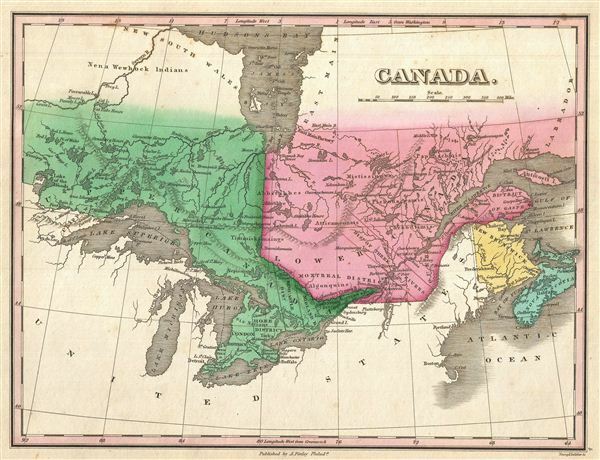 This is Finley's desirable 1827 map of Canada. Covers the Upper Canada (Ontario) and Lower Canada (Quebec), New Brunswick, Nova Scotia, and all five of the Great Lakes. Names numerous American Indian Nations throughout. Also identifies the 'Three Rivers' or Trois-Rivières is also noted. Three Rivers was a primarily French administrative region in Quebec established in the 18th century. Mile scale and title in the upper right quadrant. Engraved by Young and Delleker for the 1827 edition of Anthony Finley's General Atlas. Rumsey 0285.005 (1831 edition). Phillips (Atlases) 4314, 760, 752, 6045.